Sakae Sushi lends a new meaning and interesting twist to the idea of airplane food – now you can get your food served on a plane! I am referring to their unique kiddy set ($8.99 onwards) which serves sushi and fried tempura and fries on different uniquely designed plates e.g. plane, train. The Train set comes with soba noodles and sushi coupled with meat balls and french fries – a very appetising set even for big kids like us – the servings are adequate even for adults and definitely value for money. 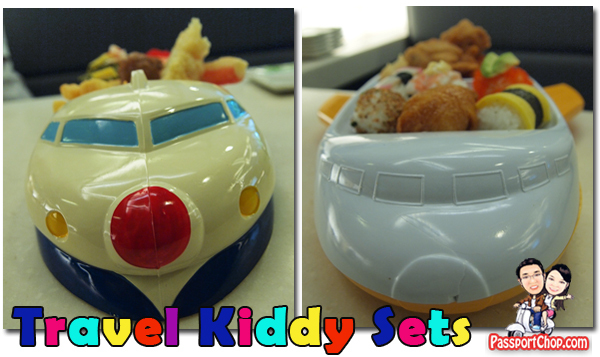 The same can be said for the Airplane set which comes with a more varied set of sushi and fried chicken nuggets. Definitely an interesting dining experience at Sakae Sushi apart from the sushi colored/pink/red plates. The restaurant policy used to require that only tables with children can order this set but this has been relaxed and you can order even if its just adults at the table. What an ingenious idea! Our 3 year old is picky and difficult to feed. I think we will be using these kiddie sushi sets even when not eating Japanese at home.